Western Americana: History of the American West: Uncovering History in Montana Ghost Towns. 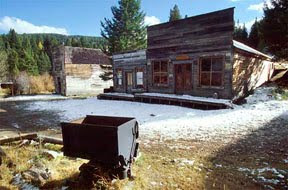 Ghost towns have always fascinated me. The old weathered buildings seem to stand in testimony to the people who risked so much to gamble their lives and future on finding rich mineral deposits in the rugged mountain wilderness of Western America. My first visit to one of these old towns was while I was on vacation with my family in 1956. We toured the Rocky Mountain States, and while in Montana, we stopped at the gold mining town of Virginia City. 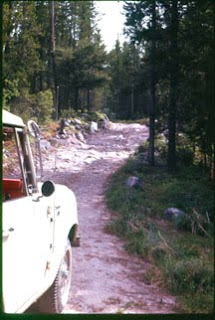 In the 1950s the town was not a tourist attraction, but an old settlement with few signs of life. We walked down what was left of the board sidewalks on Main Street and felt the emptiness of the town. I can still remember peering through store windows and seeing years of dust on scattered merchandise still on the shelves and scattered on the floor. Some folks boarded up their stores before they left, others just left. We didn’t stay long; the abandoned streets and stores cast a lonely shadow over the town. Today, those who venture high into the mining regions of the West can see some of these towns as they once were during the height of the gold mining era. With the efforts of preservationists, old towns are being restored to their original condition. 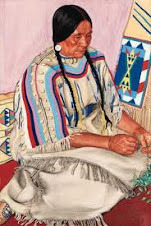 Anthropologists and historians, who are in the process of collecting cultural artifacts, which will help to tell the history of life in the Rocky Mountain West in the mid nineteenth-century, are also studying the towns. 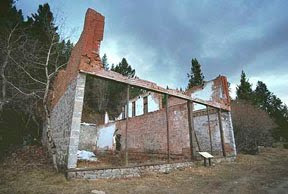 Two ghost towns in Montana are currently under the anthropologist’s microscope—Garnet and Coloma (four miles apart) in western Montana near the Blackfoot and Clark Fork Rivers east of Missoula. Of the two towns, Garnet was the most successful. Gold was discovered in the area in the 1890s; gold mining was a lucrative endeavor into the middle of the twentieth century. There were fifty mines located around Garnet; the most famous was the Nancy Hanks, which produced $960,000 in gold ore in 1896. The Nancy Hanks continued to operate until 1954—the total for the mine was $10,000,000. 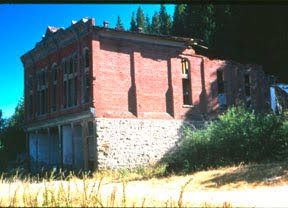 In the summer of 1970, the Garnet preservation Project began work to restore the town. All evidence indicates that Garnet was a “wide open” town that supported over thirteen saloons and many prostitutes. Four miles up the hill from Garnet is Coloma, a smaller town that is now being sifted through by anthropology students from the University of Montana in Missoula. In the summer, when the snow is gone and the beautiful Rocky Mountain wild flowers are in bloom, students ascend on Coloma in search of the town’s identity. By staking out the location of buildings, students are able to carefully dig down through many years of dirt to find the original floorboards. The quality and cut of the wood can sometimes attest to the status of the builder. And, by uncovering the flooring, researchers have found artifacts of the period that have fallen through the boards. In many of the residents, children’s toys, jars, pipes, hairpins, etc. tell us a lot about the former occupants. Artifacts can also be found by sifting through garbage dumps, which were usually located behind the cabins. Historians have concluded that Coloma had more of the trappings of civilization than Garnet. 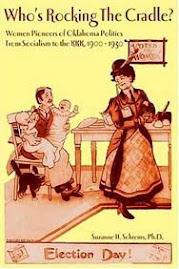 Not only were there more women, but fewer saloons and even a library. Gold was first discovered in Montana in 1862 along Grasshopper Creek in Southwestern Montana. The Town of Bannock grew quickly in six months from 400 residents to 6000 residents. In its day, the town sported a brewery, a hotel, a Masonic Lodge, a bowling alley and a brick courthouse. When the gold played out, folks moved on to greener pastures; by 1940, the town’s only residents were ghosts. The state of Montana eventually helped to restore 50 buildings that today represent a very colorful era in Montana history. Bannock was the territorial capital and the first seat of government. 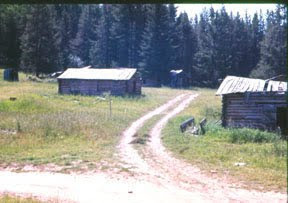 As Bannock’s population diminished, other more significant gold discoveries created more substantial towns. As Bannock’s riches declined, miners discovered gold in Alder Gulch in 1863. They soon built permanent residents and stores and called the town Varina in honor of the wife of Jefferson Davis. However, in order to stop another Civil War by those with anti-confederate sympathies, a judge recorded the town’s name as Virginia. 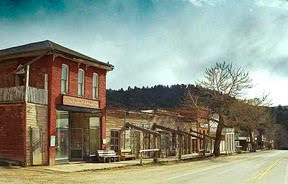 By 1864, there were 10,000 citizens calling Virginia City home. 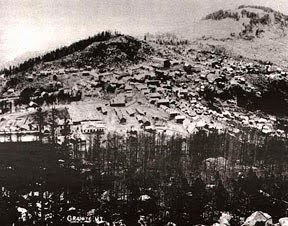 It was the largest and wealthiest town in the Pacific Northwest—in that same year, miners extracted thirty million dollars worth of gold from the gulches around the town. Also in 1864, the territorial capital was moved from Bannock to the Virginia City. 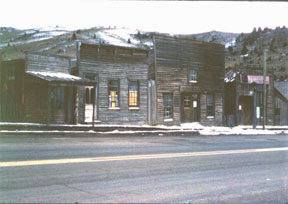 Virginia City, like many of Montana’s ghost towns, has been restored and is now the property of the Montana Historical Society. Those renovating the town have opened up the boarded windows and swept the dust and cobwebs off the floors. 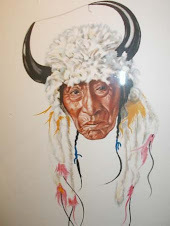 They restored the buildings and their interiors to reflect the life and culture of Territorial Montana in the 1860s. Silver could raise as mush excitement among miners as gold, especially in 1872 when silver was discovered outside of what became the city of Granite, in western Montana, about a 100 miles east of Missoula. By 1889, miners extracted on an average of $275,000 a month of silver ore from the granite mines--highest producing silver mines in the United States. The towns’ wealthy citizens build many substantial buildings. Besides a bank, with one of the strongest vaults in the Northwest, the Miners Union Hall reflects the permanent feeling towns folks must have had about their new life in the Rocky Mountain West. The difference between my 1969 slide of the miners Union Hall and that taken recently demonstrates the need for more preservation work before these towns and the history that they represent fades out of memory. 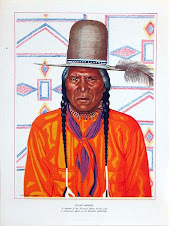 The American West played an important part in establishing American capitalism in the nineteenth and early twentieth century. The mining era was only one of many economic frontiers that encompassed the West in the nineteenth century. 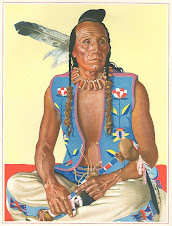 The Gold Era, as the Fur Trade Era that preceded it, has a colorful history. 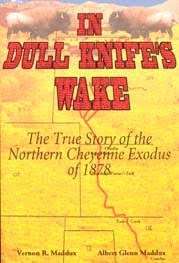 And, although short lived, the Gold era ushered in permanent settlement and continued development of the American West. It is fun and educational to visit the restored town today, but I’m glad I did get to see Virginia City, Garnet, Coloma and Granite before restoration efforts began, makes me feel like I’m a small part of the history.